Last week, ballet came to an end for the year. 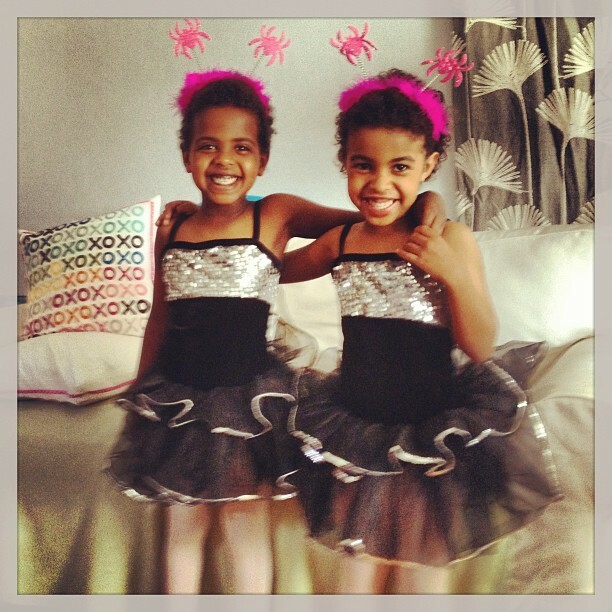 We picked our dance studio off of the internet, so I wasn’t expecting much from it, but it turns out, they really know how to put on a show, so I spent Mother’s Day morning in a beautiful theatre a few towns over, watching my little spider fairies dance. The week before the performance was a technical rehearsal, which meant dropping the kids of at the stage door, in full makeup and regalia. This is still so new for us, this dropping off thing. Dropping off is for older kids, right? Not tiny babies like the ones I guess I don’t have any more. sniff. The girls wore shiny silver eyeshadow with dark navy eye liner, to match their outfits, and they loved it – another first, since I try to paint their faces every Hallowe’en, to no avail. Tech rehearsal really took it out of them: both were asleep when we got them home, at 5:30PM. Lucky for us, we are the kind of ninjas who can carry a sleeping child in from the car and then wrestle her out of a tutu and tights and into her pajamas, without waking her up. 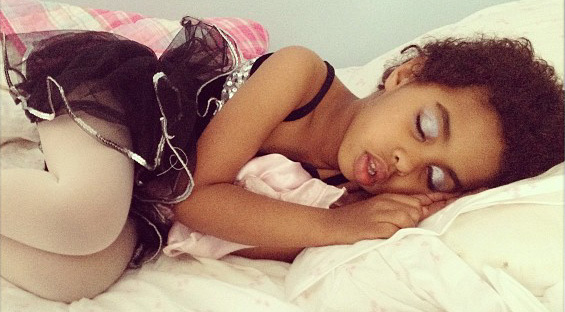 She slept in the makeup though. It’s good practice for college. Speaking of the makeup, when I bought it (because, oddly, I don’t have a lot of sparkly silver eyeshadow just hanging around the house), I also bought some makeup wipes, to remove it. But it turns out, nothing removes this stuff, so for a week, the kids were randomly pretty sparkly at school. I did their eyes for the technical rehearsal, and when I walked across the parking lot and over to the stage door with one girl slung over my shoulder (as I do), another mom, with a daughter in another class, caught sight of my little girl’s sparkle-eyes, and then frantically waved at her daughter to come over, NOW! She pulled a huge makeup kit out of her huge mom-purse, a kit that folded open, and was the size of a family bible, crouched down in the parking lot, and grabbing an even more silvery bottle of glitter did a set of eyes on her kid that would not have been out of place at Moulin Rouge, all the time sighing to the woman next to her, and assuring her daughter (who is 5), to not worry, baby, because WE won’t be upstaged like THAT. Our kids aren’t even in the same class, so they won’t be on stage at the same time. And I only did it in the first place because I thought my daughters might like it, that it might make them feel super-fancy. That did not spare me the dirty looks,though. “How dare I try to upstage their little star!” was the general consensus, played out in a few sneers and some sighing. Competitive parenting, for the win! The day of the performance was excellent. We dropped them at the stage door again, and then wandered in to our assigned seating (Heaven! ), in a theatre that doesn’t allow photography (Heaven, again! ), so parents could do nothing but sit and watch their kids perform. No cameras or cell phones in the way, no flashing, just a sweet performance, from start to finish. The girls were so good – I was amazed! They knew their whole routine, mostly without even looking at the teacher prompting them from the first row of the audience, and they smiled and looked like they were having fun. It’s a win, and next week, we get their formal dance pictures (which were taken in costume, but without any makeup at all, because they are four), and a DVD of the performance. Love this dance studio! The funniest part was that the performances were broken into three different 1 hour recitals, with parents attending one recital, based on age group. Ours was kids under 6, and then the seniors also performed at each recital. So we saw where dancers start – tentative tapping, no coordination, hilarious, being helped on and off the stage by teachers wearing head-to-toe black, to ‘hide’ from the audience, and then suddenly 8 graceful teenagers would swoop out, do some amazing, lyrical number, and then swoop back off stage. No sense of how you get from “itsy bitsy spider” to that, but it was nice to know that eventually, some of these kids might have a little talent. Speaking of a little talent, the little girl whose mother sneered at me for trying to upstage her own daughter’s stage makeup had so much glitter on her body while onstage that I was afraid she might go super-nova and wipe out life on earth as we know it. She did not know her routine, and she did not look like she was having much fun up there. But she sure sparkled! We are taking the summer off of ballet, and all other organized activities, except maybe a swim class once a week, as a relief from the summer heat. I can’t wait – the last month of constant activity was too much for us. I like life a little slower, and I like more time to colour pictures, take naps, and rule the playground.